On September 25th, 2014, the Spruce Dermatology Clinic opened its doors for the first time and immediately brought affordable, high-quality dermatologic care to millions of Americans. Today, after nearly four years of uninterrupted operation, we’re making the bittersweet announcement that those doors will be closing, also for the first time, as we finish this chapter of the Spruce story. This ending, however, is just the end of an act, not the book; the Spruce tale has much further to go. For those of you who know us only through our more recent product, Care Messenger, don’t worry; that’s not going anywhere, as we’ll talk about later. Read on if you’re interested in how we got our start, what we learned in doing so, and where we’re making our future. Teledermatology on Spruce has always been an ambitious revolution: secure, convenient, and beautiful, the platform remains today, in many ways, peerless. Our clinical, business, and engineering teams function hand in glove with the independent groups of board-certified dermatologists who practice on Spruce, and the net effect has been a medical clinic that has kept the lights on faithfully through countless nights and weekends, dozens of holidays, numerous time zones, and even the occasional natural disaster. We launched with support for one dermatologic condition, one age group, one operating system, and four states. We expanded to dozens of conditions, multiple age groups, all major smartphones, and a coverage map that reaches two-thirds of the United States population. All told, dermatologists on Spruce have helped tens of thousands of individual patients across an even larger number of visits, working tirelessly to guide people in improving and maintaining the health of their skin, one of the body’s most important organs. Dermatologists on Spruce have helped tens of thousands of individual patients to improve and maintain the health of their skin. Our skin is essential for our well-being. It forms the castle wall of the immune system, shields us from the radiation of the sun, protects our hydration, regulates our body temperature, girds us against trauma and weather, enables our sense of touch, and presents us in our most identifiable form to the world in which we live and the people with whom we share it. Skin is essential for both human physical and mental health, and it has been an honor for all of us at Spruce to work on a medical operation dedicated to its care and well-being. It has also been an indescribable honor to be a part of the journey for the patients of the Spruce Dermatology Clinic. From teenagers through the elderly, it is a consistent joy to see people discover and be delighted by a new way to get medical care. We’ve always been strong believers in the ability of asynchronous telemedicine to deliver the quality and efficiency outcomes that our medical system so badly needs, and it has never stopped feeling great to read the reviews that patients give our clinic, the overwhelming majority of which strongly confirm that belief. While user feedback and satisfaction should be important to any software company, we’ve found it to be an entirely different world when the stakes are as high as people’s health. A dissatisfied user may mean a real, physical person who is in pain or who is nauseated or terrified; a satisfied one can mean somebody who is truly ecstatic, who is finally comfortable, who is no longer ashamed to leave their house. The gravity of brushing against this raw humanity has been both profoundly humbling and constantly motivating, and it is a crucible that we, as a company, will forever be thankful to have been forged in. It may be software, but it can and does change lives. Thank you so much for changing my life and giving me my confidence back. I wish I had done this a year ago! I’m sure you guys hear this all the time, but having your help and kind messages has made an incredible difference. When I first contacted you, I felt embarrassed to even talk to people at a close proximity. Thanks to you, I can be 100% focused on who I’m talking to now instead of being distracted by pain or embarrassment. Thank you for all your help. I can finally go outside without people staring now. I’ve battled with my skin since high school and tried every drugstore treatment available with no success. Just recently, I had a horrible breakout to the point I hated going out in public. I stumbled upon this app, and now I have never felt more confident in my skin. I finally enjoy wearing makeup instead of hiding under it. I just wanted to thank you all for helping me with this issue. It is wonderful to feel normal. I can’t thank you enough for giving me my life back!! I’ve had such terrible luck lately in life, and when this happened for me, I suddenly saw a ray of light in my life. My skin has created such a barrier in my life with confidence and anxiety that I can’t wait to see what the future holds for me now that I have a professional on my side. My makeup goes on smoothly and I now take 5 minutes to get ready instead of 2 hours. My self-confidence has soared and I’m no longer so anxious when people unexpectedly drop by or I have a social event at night. I regularly go makeup free at home and feel unashamed. Thank you so much for changing my life and giving me my confidence back. I cannot express how much I love this app. It has literally been life changing for me. The patients are happy, and the medical results are good, but yet we are closing the Spruce Dermatology Clinic. This was a tough decision for us, and there are a number of hard-won lessons behind it, many of which appeared at first to be adversities. When viewed from a different angle, however, they’ve ended up lighting the path toward Spruce’s future. More on that last part is coming up next, but first, the lessons. We knew going into this that the American medical system has a complicated relationship with money, but the true depths of this reality can still be shocking. Decades of byzantine and unequally distributed health insurance benefits have left our country with an opaque, disparate patchwork of beliefs when it comes to what healthcare should cost, what it does cost, and who should pay for it. The American medical system has a complicated relationship with money, and no two patients have the same experience of cost. It all depends on perspective, and due to insurance and payment intricacy, no two American patients have the same vantage point. While there is an ongoing trend toward increased cost-consciousness and personal financial responsibility (e.g., health savings accounts, higher deductibles, and larger copays), this tailwind is not yet strong enough to sustain most types of purely cash-pay medical organizations. A second impact of our country’s current approach to healthcare payment is that a doctor’s true customer often ends up being an insurance company, not a patient. Health insurance companies decide exactly which services they will pay for and how much they will pay, and for large swaths of Americans, this sets the medical menu. Telemedicine of any type has made only tenuous inroads on these price sheets, so for doctors like the ones practicing in our teledermatology clinic, billing insurance is almost never an option. That’s frustrating for both doctor and patient, and it creates a significant barrier for innovative approaches to care, such as asynchronous telemedicine. Prescription drug pricing is also illogical and astronomical. We ended up investing a huge amount of effort helping Spruce patients get their prescriptions filled without having to take out second mortgages, and there doesn’t seem to be much of a defensible reason for why this is the case. Sometimes one large pharmacy chain would charge ten times more than another; in other cases, oddball manufacturer discount coupons were needed to save the day. This type of difficulty existed for both insured and uninsured patients, and if we ever had any doubt, it’s certainly not surprising now that prescription drugs make up the third largest category of medical spending in America. I half-expected this to be a scam, but it was BEYOND worth it! I was skeptical about addressing medical issues via an app, but my curiosity got the better of me. I was surprised by the speed and professionalism of the response I received to my concerns. I have never received such thoughtful and professional care anywhere, let alone through my phone. I never expected an app to connect me with such quality healthcare. The service I received from Spruce was so warm and personal and not at all what you would expect from an app. We loved these reviews, though. They were badges of honor, proof that we could educate people and convince them to trust us with their money, time, and health. We knew that we had a top-flight platform and fantastic doctors, and when people did give us a shot, we delivered great results nearly every time. We’re still exceptionally proud of that, but the real story, hidden in between the lines of those reviews, is that we were fighting an uphill battle. Marketing and promotional campaigns helped us get the message out and overcome some of this difficulty, but we knew that we eventually needed word of mouth to kick in for our plan to be viable in the long run. In pursuit of this, we measured satisfaction and people’s likelihood to promote us, always getting off-the-chart positive readings that matched up well with our app store reviews, many of which end with some form of “I’ll definitely be recommending this app.” Initial signs were good. But metrics on our refer-a-friend programs told a different story. It turns out that people are just not that likely to post widely on social media when an app helps them cure a troublesome rash; it’s more of a private victory. We did, however, see good uptake between family members (thank you, especially, mothers and sisters) and among very close friends. This, in combination with our large number of return patients, has sustained our clinic volume even through a total lack of paid advertising for several years now, but the math never resulted in viral organic growth. Of course this was immensely frustrating, but it also taught us a great lesson: medical care happens best in trusted relationships. This can mean that a patient knows and trusts a particular doctor, of course, but it can equally mean that a patient knows and trusts the type of care being delivered. If you ask people to trust an unknown doctor who is also practicing in a new way, such as via telemedicine, it can be a bridge too far. Hopefully, this should change naturally, both as telemedicine becomes more ubiquitous and also as everybody’s existing doctors increasingly begin to adopt more modern communication technologies. These were some of our axiomatic beliefs when we launched the Spruce Dermatology Clinic: people don’t want to travel, people don’t want to wait, and telemedicine is here and ready to help with both of those wishes. On all of those points, we were entirely right. Absolutely effortless process! Normally have to wait 2+ months to get an appointment with my dermatologist. With Spruce, I had a treatment plan and prescriptions sent to my pharmacy within 15 minutes! This was a great way for me to get some help without dragging all three kids to a doctor’s appointment. Spruce is so neat! I’m actually a night shift nurse and going to the doctor is so inconvenient for me. I hate waiting in the office. This is the perfect solution! Spruce has been so fast and really effortless on my part. This is the future of medicine. You don’t even have to leave the comfort of your own home! Amazing! I thought that I would have to go spend big bucks at a dermatologist. And with my busy schedule, going seemed like a dreadful task. But with this app I was able to get my answers and felt much better. I am super excited about this. Doctors of the future. Though we did encounter difficulties while running the Spruce Dermatology Clinic, the actual telemedicine was never the problem. In our experience, asynchronous teledermatology was highly effective from day one, and patients nearly unanimously loved it. The only situation that predictably annoyed people was when they had to be refunded and directed to in-person care for a procedure or a complex workup. Even then, these patients weren’t annoyed at the telemedicine itself; they were just upset that they couldn’t use it for everything! Patients on Spruce have made it very clear that they love being able to handle things remotely and on their own time, and that has been an invaluable lesson, even if we always suspected that it might be the case. The message was strong enough, in fact, that we looked into it more formally and put out an entire ebook on the topic of changing communication patterns and preferences in society and how they impact upon medical practices. Telemedicine is here and for real, and we’re believers. We also learned that people have a huge and mostly unmet desire for a better overall healthcare experience, especially including improved guidance and communication in their medical care. Visits in the Spruce Dermatology Clinic all occurred within the context of an ongoing, text-based chat thread between a patient, their dermatologist, and a Spruce care coordinator, and what we observed is that this chat thread ended up being the most vital aspect of care on the platform. 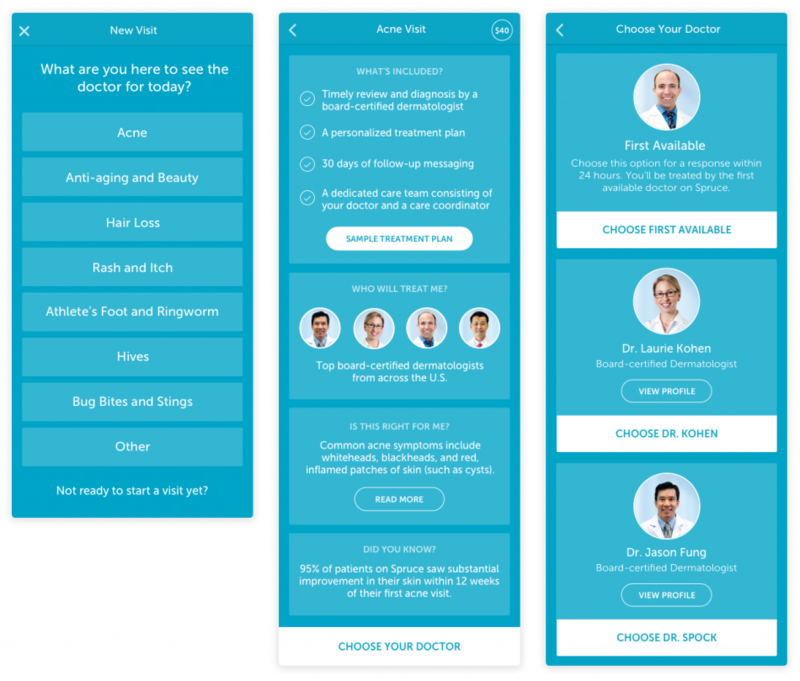 In between specific visits, patients could send short questions or pictures for their care team, and this lightweight and freeform discussion proved highly effective for medical care. Most patient issues were not things that needed a full visit or even medical decision-making; they were instead much more likely to involve pharmacy troubles, insurance questions, confusion over treatment plans, and other similar pragmatic concerns, often relating to the general difficulty of navigating the medical system. Since each patient’s whole treatment team was in their chat thread, the care coordinators could efficiently handle the small issues and pull in the doctors only when necessary. This led to great response times and a win-win situation for both patients and providers. The Spruce Dermatology Clinic showed us clearly that excellent medical care depends on excellent communication and that many medical issues are actually care navigation issues. It didn’t take long for us to realize that a lot of medical care on Spruce was actually occurring over these short messaging exchanges within the larger, sustained conversations. Telemedicine ended up being much more about ongoing discussions than about discrete visits, and this was clearly beneficial for care and outcomes. The chat thread on Spruce created a tight feedback loop between patient and care team, and it provided patients with access that they loved while allowing physicians to make observations and course corrections more frequently and quickly than they could with traditional care. Despite there being no extra cost for messaging, we found that only a small percentage of patients sent a high volume of messages. Most people had entirely reasonable inquiries and concerns, if they had any at all, and they were palpably delighted to be able to communicate these to their care teams in text format, instead of being forced to deal with phone trees and voicemail or having to leave untrackable messages with frontdesk staff. Increased availability, combined with telemedicine support, also meant that we were able to prevent many undesirable outcomes, such as expensive emergency room visits. Concerned patients could have their urgent symptoms evaluated quickly on Spruce, often at times when traditional offices would be closed, and this allowed important triage and treatment decisions to be made with the best possible guidance. The Spruce Dermatology Clinic showed us clearly that excellent medical care depends on excellent communication and that many medical issues are actually care navigation issues. We now feel strongly that the future of medicine lies, in large part, in improved access and availability through better medical communication, and through care teams that are better equipped to interact with their patients in a holistic and longitudinal fashion. A better healthcare experience is attainable, and people want it. In response to what we learned from the Spruce Dermatology Clinic, we began building our Care Messenger platform more than two years ago, and its underlying ethos and technologies are fundamentally based on the most important lessons of the Dermatology Clinic. We learned that ongoing, accessible communication is the basis of good medicine, and that this communication happens best inside of existing trusted relationships. We learned that good outcomes depend just as much on care navigation and team coordination as they do on diagnosis. We learned that telemedicine really is as effective as promised, and also that it comes in many forms and should be embraced flexibly. We learned that value-based medicine can be a powerful force for good, but that it must be matched holistically to supporting payment and incentive structures. The successes and critical lessons of the Dermatology Clinic will continue to live on at Spruce, both through Care Messenger and also through our deep-rooted belief that a better future for medicine is not only possible but essential. So we built Care Messenger, a cloud-based healthcare communications application that enables medical teams of any size and specialty to implement advanced, secure workflows for both in-person and remote care. Today, thousands of organizations, ranging in size from solo practitioners to large regional health networks, successfully use Care Messenger to power all of their medical communications, including advanced phone systems, fax, SMS texting, secure messaging, video chat, and asynchronous telemedicine. As we did in the Dermatology Clinic, all communication on Care Messenger is treated as part of a unified, chronological medical record, and population management and team collaboration features are overlaid to allow organizations to develop high-quality, modern approaches to caring for their patients. In truth, the capabilities of Care Messenger now far exceed those of our original dermatology platform, and this has been our goal since its inception. The strong adoption of Care Messenger has also convinced us that its foundation and approach are correct, and we are now committed to focusing completely on its growth. It has been an unforgettable honor to run the Spruce Dermatology Clinic, and we are sincerely thankful for having had the opportunity to do so. We are especially grateful to the exceptional dermatologists on the platform, who trusted us with their professional practice, and to all of the wonderful patients, who trusted us with their time, their attention, and most importantly, with their health. And while we are closing the doors of the clinic, its many successes and critical lessons will continue to live on, carrying forward through Care Messenger and through our deep-rooted belief here at Spruce that a better future for medicine is not only possible but essential. The Spruce Health CEO, Ray Bradford, has also written a post about our Dermatology Clinic closing, and it’s absolutely worth a read for more insight on the corporate and business context for this decision. Ray’s leadership and boundless passion for the future of medical care contribute in critical ways to the bedrock of all that we do at Spruce, and it’s been both a professional and personal pleasure of mine to work with him on our Dermatology Clinic. Here’s to a bright future for Care Messenger! As of now, the Spruce dermatology app will continue to accept new visits for the next week, after which follow-up care will be available for an additional 30 days. Our care coordinators will be fully accessible during this time to help patients export their medical records, should they wish to, and to assist them in navigating their future care options. Please don’t hesitate to reach out to us with any questions or concerns at support@sprucehealth.com.